That idea of being faithful in the little seems irrelevant to the big accomplishments in life. Little seems to be insignificant. But if you look at the little as being a bigger part of the whole then you start to recognize that the little is actually really, really big. If my little decisions lead me to a great big wonderful ending then the little decisions matter. Towards the end of the year, I found that our family as a whole was in full consumption mode. We were bonafide consumers. We were card carrying consumptive monsters. It was as if we were starving and couldn’t get enough. We were clearly not starving. We were doing whatever it took to get away from the quiet, the boredom and being still. To top it off, I even had that sick ‘I ate too much’ overfull feeling. I listened to The Rise podcast and Rachel Hollis who was interviewing a gentleman named Brendan Burchard about forming habits. He mentioned that on average a person watches 4 hours of television a day. He equated that to 13 years in our lifetime. That fact smacked me upside the head and I recognized that we were losing years of our life by this little thing we did on a daily basis. I recognized that we needed to change as a family. It was important for us to be producers not simply consumers. We want to make a mark. We want to create. We want to show up and do something not simply sit by and watch everyone else live life. So, we decided to make a decision and cut out a night of consumption and dedicate it to creating. Tuesday creative nights where we turn off the TV and we set our intention to create something together or separately. It was a little decision, but 52 weeks later we will have something to show for it. We also don’t want to be at a four hour consuming pace. No thank you! We wanted to cut that in half. We want to get years back by making a shift in the little that will result in much. Our first Tuesday night was a complete and total bust. Yep, a disaster. It was like the creative water wheel in our home was buried in sludge and we spent most of the night trying to dig out the wheel in order to get it to spin. My husband had an insane sinus infection. My daughter was frazzled from getting back into the routine in middle school. I was disappointed because it was like all of the wind had been sucked out of my sails. But we kept the TV off and we ‘tried’ to be creative. We talked about what we would do creatively. We went round and round to end up with nothing. Sometimes you got to shake off the rust and start moving the wheel. One of my favorite business entrepreneurs, Blake Mycoskie, recently wrote a book called Start Something that Matters. Blake is known not only for his curly locks, but in founding a company called TOMS. TOMS shoes is based on a social business model that relates directly to giving back. With every pair you purchase, TOMS will give a pair of shoes to a child in need. One for One. And if you’ve been under a rock somewhere for the last four or five years One for One has become a movement. I personally own two pairs, my husband has four pairs and our daughter has one pair. 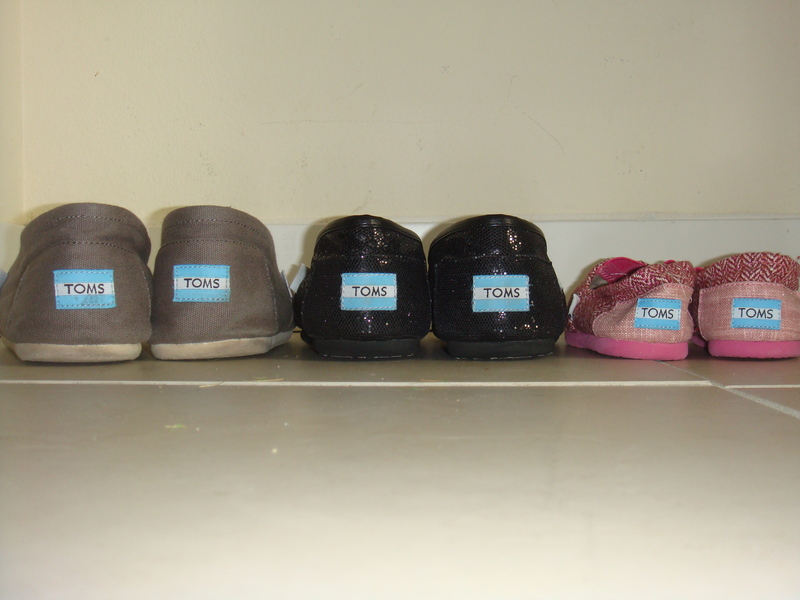 A family that wears TOMS together knows that it has given shoes to another family in need. I love that I am giving to someone through my purchase. It gives a greater purpose to the purchase, more than just me stylin’ in a new pair of kicks. But what inspires me even more is that Blake’s social business model infuses what capitalism is today with a greater purpose than to just simply make an elite few rich and return value to some investors somewhere. It’s about giving back as much as it is about profitability, because returns are measured not just by what’s left in the bank account at the end of the day but how much has been given from that bank account. Life is not all about taking and getting your own, but it really is about what you can offer someone else to make a difference in their life. TOMS was started in 2006 with an idea Blake had after visiting Argentina and meeting a lady in a village where 250 kids needed shoes in order to attend school. Blake thought it wouldn’t do any good to just give them a single pair of shoes that they would outgrow in four months, so he developed an idea that would supply these kids with shoes continually so that they could continue to receive an education. Upon his return home he created TOMS to give away a pair of shoes for every one that was sold. Sell a pair of shoes today, give away a pair tomorrow (TOMmorrow Shoes aka TOMS shoes). Blake’s initial lofty goal was to sell 250 pairs of shoes from his Venice apartment, online and at a nearby shop American Rag. That first year he sold 10,000 pairs, by 2010 TOMS had sold 1,000,000 pairs and with a critical mass reached this year, 2011, TOMS has sold more than 2,000,000 pairs since it began in 2006. That is generosity in the realm of multiplication. But it doesn’t end there. Realizing that the need is greater than footwear TOMS now makes its giving shoes in Argentina and Ethiopia creating jobs in the very places it gives it shoes away. Sitting on this side of the idea with 140 employees, manufacturing on three continents and a mountain of success you may be thinking that you could never achieve a similar impact. But from every end remember the beginning. The beginning was just an idea that was acted upon. In the beginning it was just Blake and three interns running the business out of his apartment with a small achievable goal in their sights. What need do you see around you? What purpose could you apply to fulfilling that need? Start out with a small achievable goal and see what wind blows in your sails and where it takes you. Blake himself espouses the power of starting small. So try taking the first step of your journey today.